New Year’s Eve – Dec 31st This card shows us how to release the old and let in the new. This relates to both our external lives and our inner being. How appropriate to have a card of rebirth in this position. As the cycle of an old year comes to an end, a new one is ready to be born. New Year’s Eve is that threshold point just as the bear stands as a guardian at the threshold of a new life. The bear watches over the soul as it enters the mound ready for a new life. Perhaps I need to trust that someone is protecting me as I try to forge a new life from the left over parts of the old one. At the end of this year, I need to have the confidence to enter that tomb and greet the new year with a renewed sense of purpose. Life is a series of deaths – some small, some enormous – but at the end of each is the opportunity to forge something new. This has been the deeper message of these daily draws – healing, letting go, trust and understanding that everything moves in cycles. Day of Rest: – Dec 30th This card shows us how to walk our path in a relaxed and confident way….with the ability to deal with stressful situations in a philosophical, detached way. This is my first wands card so far. 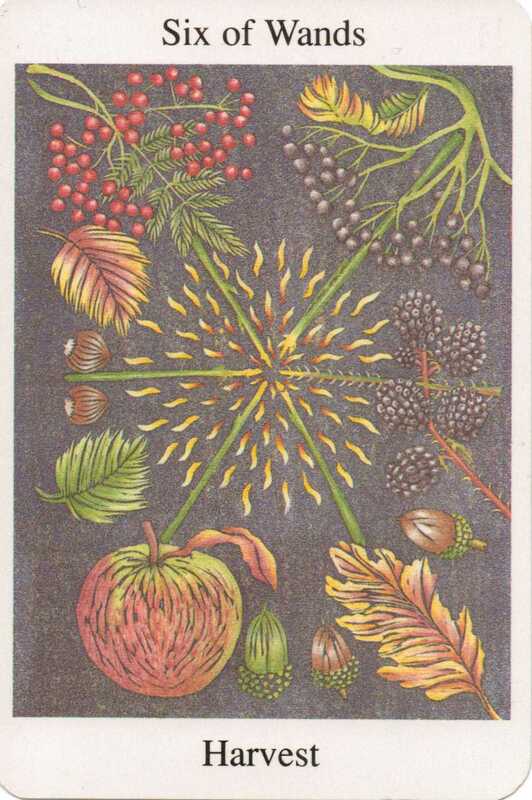 The card shows an abundance of berries, fruit and nuts. All things which have been growing steadily over many months and which are now ready to be eaten. 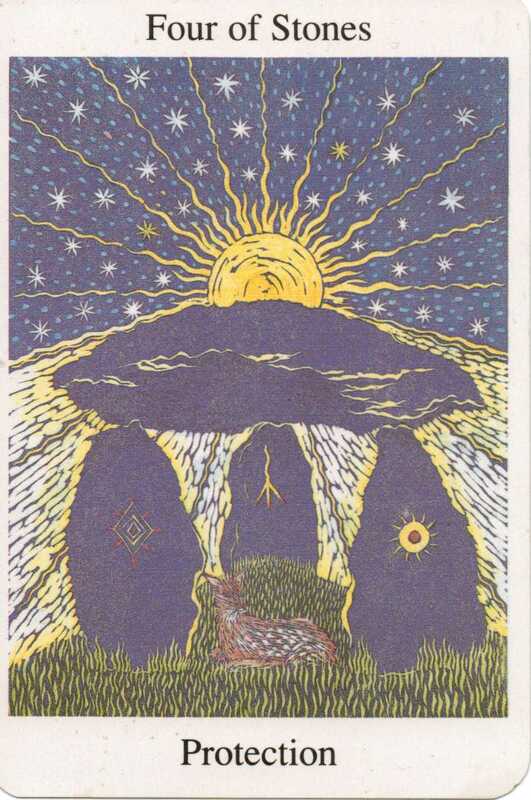 I can’t help but see how this card links to the Wheel of Fortune – both speak of cyclic activity, of the ebb and flow of different stages – growth, harvest and fallow periods. I see this is as a message that I need to deal with stressful situations with the understanding that they too shall pass. Eventually, a more abundant joyful time will come back. There is also that message of thinking carefully about what I put out, of reaping what I sow. How much of my stress is because of situations I have chosen? Day of Nymphs – Dec 29th This card encourages us to connect to our playful side, our inner child and how best to cultivate this aspect of ourselves. A figure lies between four stones receiving healing while under the protection of a shamanic guardian. In order to connect to my playful side, I first need to undergo some healing. This links back to the three of arrows from earlier. In order to integrate all aspects of myself, I need to balance them all first. This card also links in with the idea expressed in the Balance card of giving and receiving – a child allows itself to be looked after, something I struggle with. I prefer to do everything for myself and find it quite hard to ask for help. There is a message here that I need to allow others to help me when I need it. Feast of Alcyone: – Dec 28th This card gives us a personal inner message – one that speaks directly to our heart and spirit. As a personal message, this card seems quite bleak at first glance. Do I feel like life is a struggle? It certainly has been at times for me. However, in each time of deep struggle, I have grown as a human being, discovering new facets to myself and facing a new direction with courage. The struggle has led to the birth of new things in my life and forces me to look closely at what I need to change. 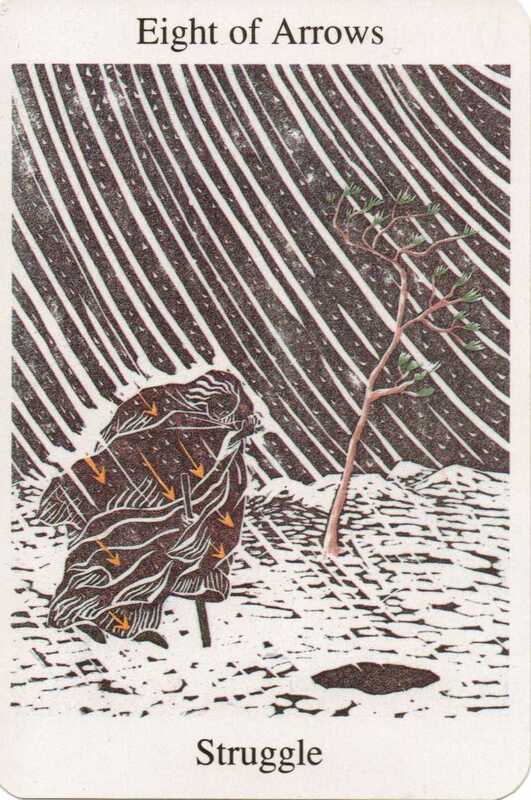 It is a card of perseverance – keeping going despite the prevailing winds. Maybe, I need to change direction and let the wind take me where it wants, rather than battling against it. 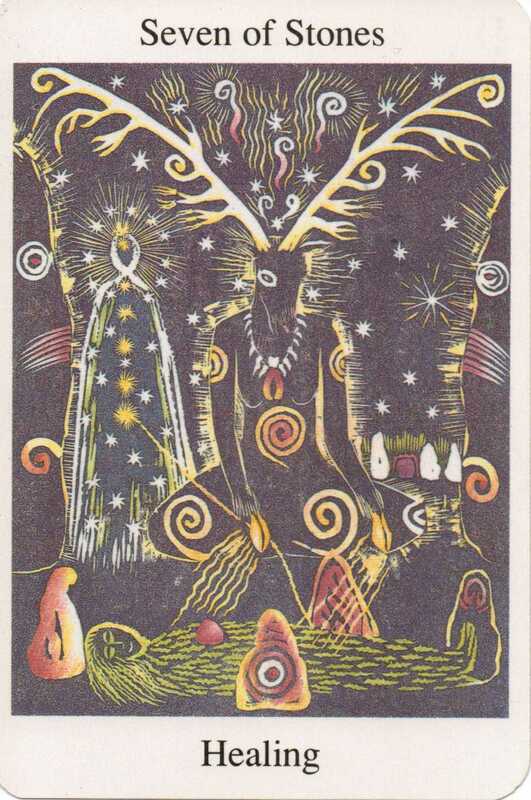 Birth of Freyja: – Dec 27th This card points to issues of love, luck, artistic and creative expression and female wisdom. 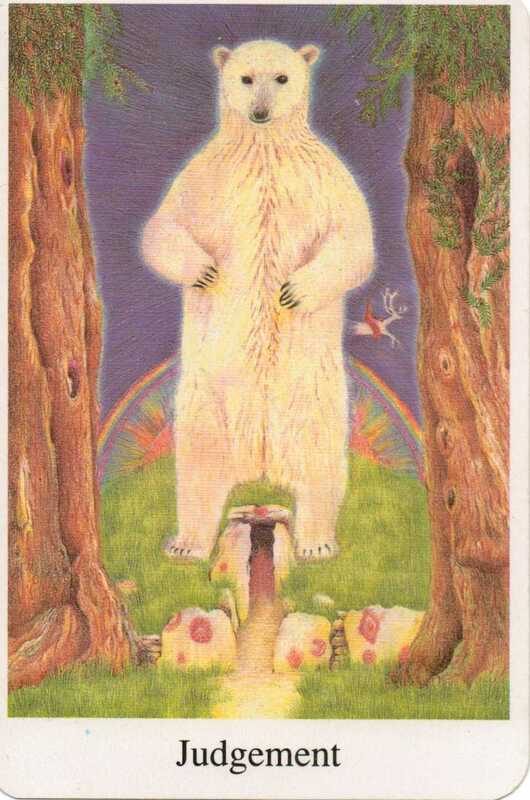 This card indicates profound healing, a period of introspection. The mirror is held up indicating a time for learning about the self. 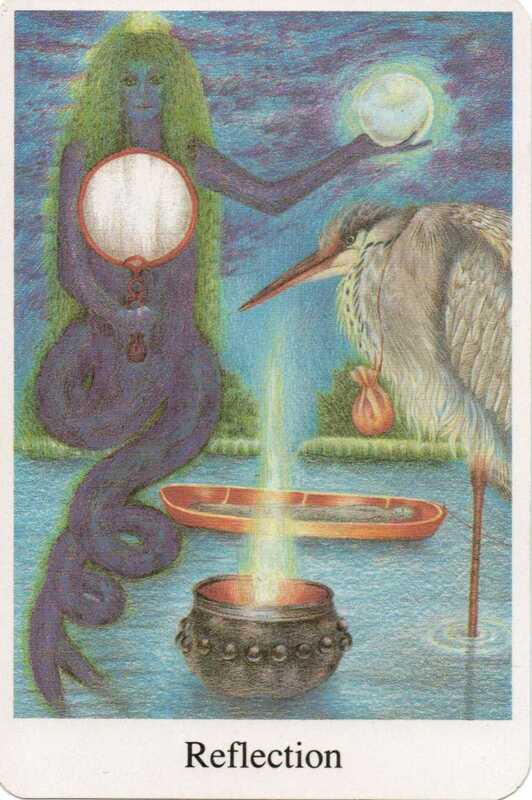 It shows the ability to look deeply and see what is being reflected.The crane represents wisdom while the cauldron represents inspiration. It seems to give a message more related to my creativity. When I am engaged in creative activities, I feel a deep connection. For me, it is a solitary pursuit which allows me quiet time for reflection. Yuletide, Kwanzaa: – Dec 26th This card shows us how to express nurturance, to attend to our families and to express the protective energy within us towards others. 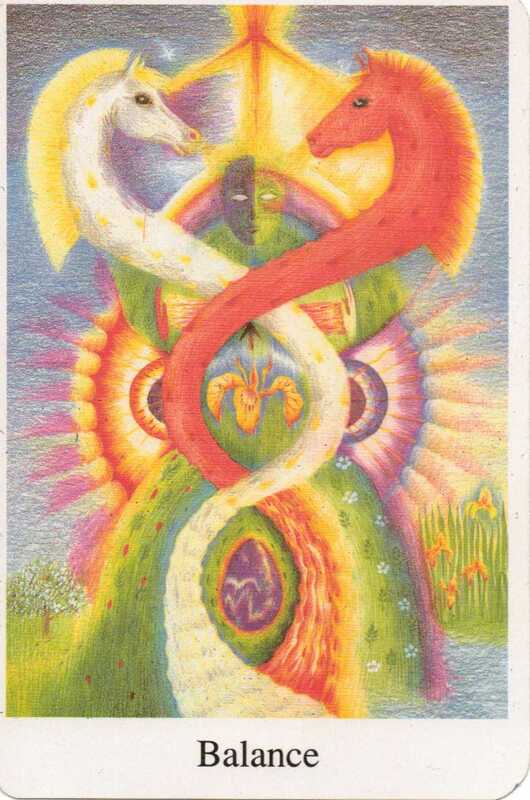 The card shows two polarities who face each other equally strong. The central figure seems to mediate not allowing one to become stronger than the other. I can see two messages in this card. One, to balance the energy of giving and receiving within my family and two, to balance the needs of mine and my husband’s family. Sometimes it can feel like a delicate balancing act ensuring that we see both sets equally. It can also indicate a time to review who may need us around more. Is it time to move? Festival of Life, Christmas: – Dec 25th This card shows us how to connect directly with Spirit. The sun rises over a dolmen while a fawn shelters underneath it. The fawn represents the soul and the dolmen is the protection it needs to thrive and grow. The connection with light on this card makes me think that those early mornings might be a good time to connect. Time to revive morning meditation.